Valencia have announced their fifth signing of the summer transfer window. 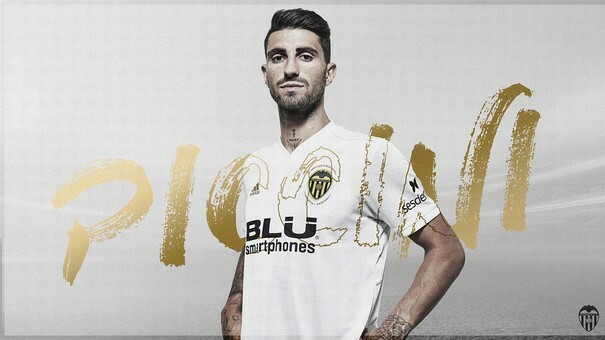 Right back Cristiano Piccini joins from Sporting Lisbon for a fee somewhere between 7 million and 10 million euros (sources are unclear.) After starting his career in his native Italy, Piccini moved to Betis, where he spent 3 seasons, before joining Sporting last season, where he reportedly had a decent season. It's no secret that the right back spot has been the one that Marcelino has been the most dissatisfied with this season, with Vidal dropped early on and Montoya only getting half the games with Vezo filling in most of the time. Valencia were interested in people like Meunier, Hateboer of Atalanta and Darmian of Manchester Utd, but all of them proved to be too expensive. The reasons for going for Piccini seem clear enough. He's of the right age (will be 26 in September) has La Liga and Champions league experience and brings height to the team. Marcelino has been concerned that the club has been conceding goals from aerial balls from set pieces, while our defenders have offered little threat in the air from set pieces (Vezo scored the only such goal last season in the Copa.) Piccini, like Diakhaby, will add that height needed. With his signing, it looks like Montoya will follow Vidal out the door. Negotiations are rumoured to be underway with Betis, with them offering 5 or 6 million and Valencia wanting 10m. If Montoya goes, then Piccini will be the main right back. It remains to be seen if another one will be signed. If not, Vezo, Paulista and Wass would be cover there. We will see how this works out. My only thing with it is that if it is 10 million, we could've got a better price, especially by part-exchanging Nani, who went the other way. Still, it's good to see more movement this transfer window. Last year, by 10 August, the club had only signed Neto and Maksimovic. I guess at least 40 million to come from the Champions league helps speed things up. Other transfer news is that Kangin Lee has signed a new contract, with his release clause being bumped up to 80 million in line with Alemany's strategy of protecting our promising youth players from vultures like FC Tourist of Catalonia or the premier league. Unfortunately, it didn't work with another youngster, Ferhat Cogalan. He refused the club's offer and has chosen to sign for Lille, with Valencia getting 150,000 for developing him. No other news, just rumours.... the most likely is that Gameiro is still said to be coming. The club is still working to get Guedes, which may be on loan again. Possible interest in Andre Gomes returning, while Barcelona still maybe interested in Parejo. Lastly, with lots of defenders here now, Javi Jimenez may go out on loan to gain experience.